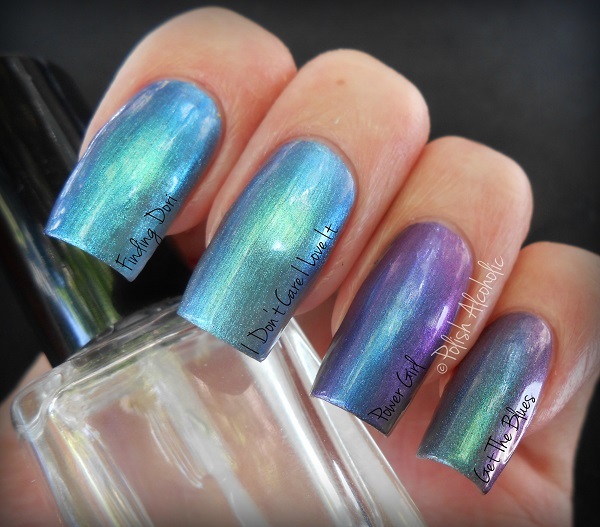 Essence recently released their Aquatic Collection. Along with 5 pretty shades there’s also a duo chrome one called Finding Dori, which I’ve used a few days back for my water marble mani (see it here). It immediately made me wonder if it might be a dupe for I Don’t Care I Love It (previously swatched here) from their Road Trip Collection. 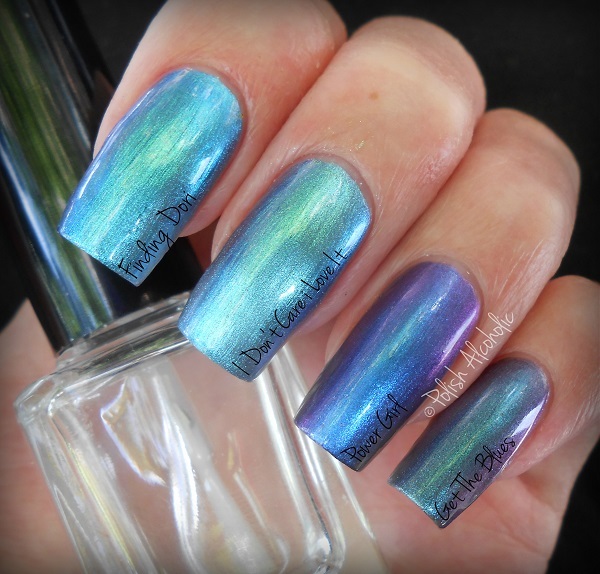 While looking for dupes I found two other polishes that looked similar. Time for a comparison! First a look at the bottles that I picked for this comparison. 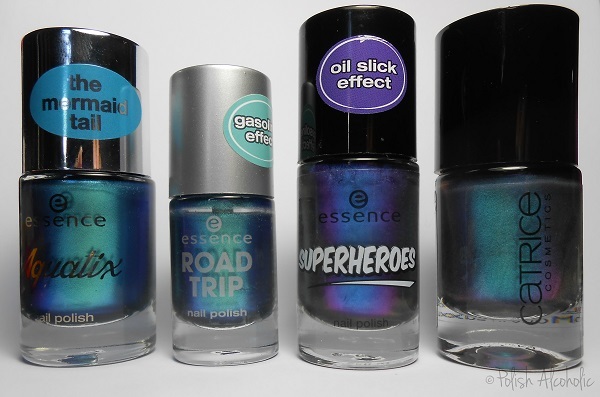 Fltr: Essence: Finding Dori, Essence I Don’t Care I Love It, Essence: Power Girl, Catrice: Get The Blues. Alright, Power Girl has way more purple to it compared to the other four. Power Girl is definitely a beauty on its own and is in no way similar to the other three. Get The Blues is a more darker blue toned hue compared to the others. But I think it’s safe to say that Finding Dori is a recycled version of I Don’t Care I Love It. For those with a keen eye: Finding Dori is slightly frostier (is that even a word?) than I Don’t Care I Love It. Color wise I honestly can’t tell the difference. Also, Finding Dori is a tiny tiny tiny bit brighter than I Don’t Care I Love It. I think you need a magnifier to see that though. Finding Dori was completely opaque in two coats while I Don’t Care I Love It needed three. Get the Blues by Catrice also needed three coats for full opacity and Power Girl was opaque in two. As for the color shift properties… not spectacular with all of them, but still pretty. I Don’t Care I Love It has a beautiful shift in an extreme angle though. I honestly can’t tell you which one I prefer. One more… What do you think? 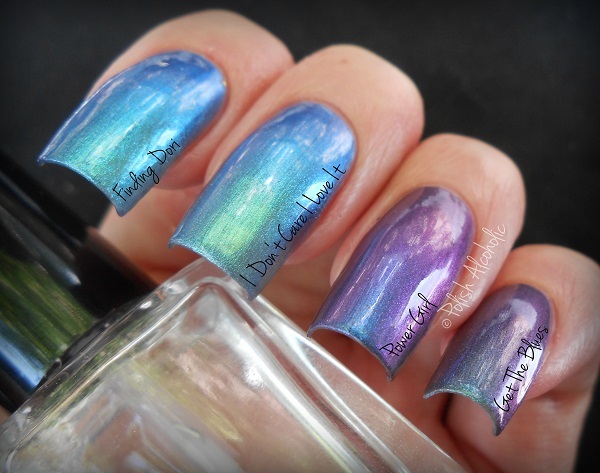 This entry was posted in Catrice, Essence and tagged catrice, comparison, essence, finding dori, get the blues, i don't care i love it, power girl, review, swatches by Polish Alcoholic. Bookmark the permalink. Great shades. I agree that the first two are damn near identical.